Well, I am sorry for not blogging for over 2 weeks, I have been on holiday and on my return had a lot of little bits to sort out. I spent a lovely week in Crete, nice food, nice wine, just sunbathing and catching up on a pile of books I wanted to read. Whilst I was away I found myself thinking about how to continue with this blog. When I started blogging seriously a while ago I did a lot of research into what it takes to make a “successful” blog. I found myself being seduced by all the pro-bloggers out there who say you should blog every day and seem to be incredibly prolific, particularly the excellent and prolific Leo Babauta of Zen Habits. So I tried to write a blog entry every day. Even if I didn’t really want to. I suddenly realised I had been seduced by speed again! I wasn’t planning any entries because I wasn’t enjoying doing it and I was treating them like a chore I had to get out of the way before I could get on with my “proper work”. mattcaulfield.blogspot.com – This was my first ever blog and has been going since 2005. Nowadays I use to write my thoughts about NLP (Neuro linguistic Programming) and related subjects. thetaichiguy.blogspot.com – A brand new blog talking about my practice of the amazing art of Tai Chi. I am not primarily a blogger. I would consider myself primarily a coach, consultant and trainer/teacher. I spend most of my time working with people helping them slow down. Blogging is a big part of that, but it is not the biggest part, if that makes sense? So, by trying to emulate the people who primarily blog, I was finding the quality of my blogging was slipping, some days I would be proud of what I had written, other days I would just slap something up, not planning, not proof reading and not particularly caring. I didn’t feel many of my entries really captured my personality and the passion for the subject that I have. And that is when I made the decision to commit myself fully to the slow blogging ideal. I wrote a couple of entries sometime ago about Slow Blogging (see the posts here and here) and then totally failed to actually start slow blogging! Slow bloggers eschew the idea of immediacy in blogging for a more measured and considered post. It is about quality not quantity and lives by the axiom “it happens when it happens”. So, from now on I am no longer going to rush out entries just for the sake of posting. I am going to think, plan, study, draft and (endeavour) to write longer, better written entries with more depth. Hopefully. I will, of course, post shorter blogs, from time to time with news and interesting tidbits I have to say that don’t require a more detailed entry. In fact, to move away from the association that blogging has with immediacy, I intend to call this a journal from now on, not a blog. The aim is to write a well-developed entry once a week, with maybe the occasionally serial spread out over days or weeks. To be honest, I don’t know yet, I am still working it all out. 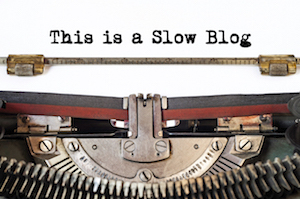 I will be updating this site over the next week or so to reflect this shift of emphasis and will be adding more information about Slow Blogging, including my own Slow Blog Manifesto. I hope you stick with me whilst I experiment and find my feet. Now, if you will excuse me, I am off to take the dogs for a walk. PS, I will also be applying the idea to twitter. Where I intend to “twitter when I twitter” no sooner, no later. I have never really got my tortoise mind around twitter and hopefully this new philosophy will help. Who knows? It’s all very exciting isn’t it? !